European and domestic automakers are in the process of changing over to super-hard, scratch-resistant, clear coats. DuPont has recently released it's SupraShield™ scratch resistant clear coat and PPG has followed with their Optech™ and CeramiClear™ clear coats. In 2005, Mercedes Benz switched to a nano, ceramic clear coat. This is on all cars with a paint code that starts with "C". Volvo has started using a scratch resistant clear on their top models in 2006 and hopes to have all models switched by the end of 2006. These new, harder, clear coats are scratch resistant, not scratch proof. 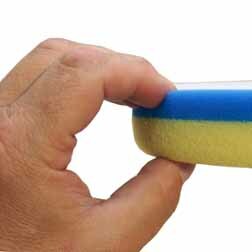 The problem is, when scratched, conventional pads and polishes may not have the power to remove the defect. Several manufacturers, Menzerna of Germany and a joint-venture with BLACKFIRE in the U.S. have brought new polishes and compounds to market designed to remove swirls, spots and scratches in these harder clear coats. That left one area still in need of improvement - the foam pads. Lake Country Manufacturing, one of the world's largest manufacturer of foam polishing pads, has spent the last two years working with automakers in Europe, Canada, the U.S. and Mexico and with polish suppliers (specifically Menzerna of Germany) to develop a new generation of foam polishing pads. The result is a patented technology they call CCS, Collapsed Cell Structures. This technology, which puts a pattern of collapsed "dimples" on the surface of the pad, can be used with all of Lake Country's European, engineered foams. While developed for the new super-hard, scratch-resistant clear coats, CCS pads can also be used on conventional paints and clear coats. These new pads have been tested and approved at the OEM level and were introduced to the after market at Automechanika in Frankfort, Germany, in September of 2006 and at the International Autobody Congress & Exposition,(NACE), Las Vegas, NV. in November of 2006. These new, CCS Pads are in very tight supply due to strong, worldwide OEM demand. Classic Motoring Accessories is very proud to have been chosen by Lake Country Manufacturing as the initial domestic supplier of CCS Technology pads for the enthusiast, U.S. market. The newer, harder, scratch-resistant clear coats require longer polishing times to remove swirls, spots and defects. 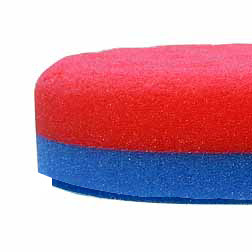 The longer you polish with conventional foam pads, the less effective they become because polish migrates below the working surface of the pad. The pad "dries out." CCS Technology solves this problem using strategic patterns of partially closed foam cells. These cells slow the rate of polish absorption, gradually releasing polish as needed by the operator. 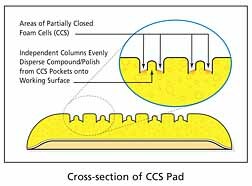 CCS Pockets reduce surface tension, prevent pad skipping and allow the operator to run the pad flat on the working surface. This new, patented, Constant Pressure technology uses a layer of engineered, instant rebound foam between the pad and the backing plate to absorb off-axis movements while keeping the pressure of the pad on the surface constant. The other patented, innovation incorporated in CCS Pads are a curved outer edge. The curvature on the outer edge of the pad allows easy transitions over seams and inclines. Standard CCS pads are flat-cut. We pay extra to have the top edge rounded over because it prevents pads from snagging while polishing seams and edges. We also pay attention to the back of the pad. Standard CCS pads run the Hook and Backing material to the edge of the pad. This material is very course and can cause scratching if it hits the paint while working in tight spaces or around mirrors and wings. We cut the Velcro brand fastening material back 3/8 inch from the edge. This allows you to work right against corners, mirrors, wings and complex angles without fear of scratching the paintwork. Whether you're a novice or a seasoned professional, the advanced features of our CCS pads will yield consistently excellent results.